The first section of the introduction begins by providing a presentation of the nature and objectives of the workshop which took place from October 2-3 and concludes with a synthesis of the contributions of John Donoghue, Raffaele Laudani, Matteo Battistini and Paola Rudan. The second section discusses on some of the questions addressed during the introduction to the workshop that took place on October 2 (Neither disobedient nor rebels: arguments from the laws between the Old and the New World), through a reading of some English and French sources from the ends of the 17th and 18th centuries: the anonymous History of Self Defence, in requittal to the history of passive obedience (1689); Algernon Sidney, Discourses concerning Government (1698); James Murray, Fast Sermons (1781); Théophile Mandar, Des insurrections. Ouvrage philosophique et politique, sur le rapport des insurrections avec la liberté et la prospérité des empires (1793). Mandar Th. 1793, Des insurrections. Ouvrage philosophique et politique, sur le rapport des insurrections avec la liberté et la prospérité des empires, Paris: De l’imprimerie des directeurs du cercle social. Rue du Théâtre Français, Masson. Seller A. 1680, The History of self-defence, in requital to the history of passive obedience, London: Printed for D. Newman at the Kings-Arms in the Poultrey (front page). Sidney A. 1698, Discourses concerning government... published from an original manuscript of the author, London: Printed, and are to be sold by the booksellers of London and Westminster. This collection of essays comes as the result of the international workshop Rebellion, Resistance and Revolution Between the Old and the New World: Discourses and Political Languages held at the Department of History and Culture at the University of Bologna, 2-3 October 2013. The workshop was the culmination of a biennial project with the same name carried out by our research unit in Bologna as part of the 2009 PRIN project, Between Europe and America: circulation of economic ideas, political addresses and revolutionary models, XVIII-XIX centuries, financed by the Ministry of the Universities and Research. Coordinated by Antonino De Francesco (University of Milan), the group brought together research units from the University of Turin, the University of Basilicata, and the University of Catania. The workshop format asked presenters to focus their talks around one or more sources they consider to be fundamental to research on the workshop’s theme. As such, also the essays here follow the same organizational scheme and have appropriately been published in the section “Sources and documents”. Of the six presentations made at the workshop, only four could be included at the present time: those of John Donoghue (Loyola University, Chicago), Raffaele Laudani (Department of History and Culture, University of Bologna), Matteo Battistini (Department of Social and Political Sciences, University of Bologna), Paola Rudan (Department of History and Culture, University of Bologna), together with the present introduction. Unfortunately the papers by Luca Cobbe (University of Macerata) and Pierre Serna (Paris, Institut d’Histoire de la Révolution française) could not be elaborated for publication here. However, I mention them briefly in my introduction in order to give as comprehensive a picture as possible of the two days of the workshop — two days filled with intense reflection and discussion, in which they also actively participated, together with others, such as Antonino Di Francesco, who coordinated the PRIN 2009 research group on a national level, Karl Härter (Max-Planck-Institute for European Legal History, Frankfurt am Main), Maurizio Ricciardi (Department Political and Social Sciences, University of Bologna) and Francesca Sofia (Department of History and Culture, University of Bologna). In order to relate the importance of the specific research carried about by the Bologna unit of the PRIN 2009 this introduction will look at each paper with the objective of individuating the problems and/or sources that support scholarship on the justification of legitimate resistance (the so-called “right to resistance”) put forth by those accused of sedition or rebellion in the form of disobedience toward government; not so much in the great revolutions (English, American, and French) as in the numerous forms (all of them I would say) of tumults, rebellions and revolts which took place between the middle of the 14th century and the middle of the 19th century and which have long been the subject of historiographic research. Such an investigation can be carried out in two different but connected directions: through the textual analysis of the political-juridical language of the arguments made in defense of communities accused of the crime of rebellion, as well as through the interpretation and reinterpretation of certain wars, rebellions and revolutions from the Early Modern period up until the beginning of the 19th century. Let’s have a brief look at the themes investigated in each of the papers. In John Donoghue’s Transatlantic Discourses of Freedom and Slavery during the English Revolution the author underlines the central importance of the Atlantic dimension for the English Revolution, demonstrating how the experiences of groups from the English colonies who had settled in Rhode Island in the mid-1630s and returned to England during the first phases of the revolution came to have a crucial impact on the formulation of arguments on liberty and slavery — arguments which for many years historiography considered to be typical of the 19th century. Each of the three types of arguments on liberty analyzed by Donoghue (liberty of conscience, liberty of the body and liberty of commerce) is presented in opposition to slavery, understood as economic restriction, political tyranny, as well as religious persecution. The abolition of slavery understood as the privation of personal liberty was proposed as one of the points of the constitution of Rhode Island and was approved in 1647, the same year in which the Levellers presented their Agreement of the People in England. In both cases the radical puritan and republican groups’ campaigns for liberty demonstrate, for Donoghue, how the Atlantic dimension transformed the fight of the Levellers against political slavery into a protest of and, then, campaign against the rise of economic slavery in the colony of Rhode Island. Raffaele Laudani’s essay, Nova Totius Terrarum Orbis: Modern Sovereignty and the Neutralization of Atlantic Disobedience, proposes interpreting Thomas Hobbe’s Leviathan and John Locke’s Treatise of Government through the lens of the Atlantic, using the spatial concepts of “Land” and “Sea” as examples of two modern political philosophies: “Land” being the civilized and ordered world of the European system of sovereign states, in which politics neutralize conflict and disobedience is transformed into the extraordinary event of revolution; the “Sea”, then, is the conflictual space of the colonial world, in which disobedience and disorder are potentially inherent conditions of politics, and power operates in the form of government over an unstable and conflictual society. The two represent opposing conceptions of modern sovereignty, in which the problem of the relationship liberty/slavery in its political dimension (already discussed in Donoghue) plays a fundamental role. For Hobbes, sovereignty through contractualism (the voluntary renouncement of man's natural rights) neutralizes the type of liberty that threatens the Imperium, symbolized by the uncivilized people of America. On the other hand, for Locke, sovereignty in no way entails the voluntary renouncement of the natural rights of man, neither in the colonial context in which power is the result of conquest, nor in the political space of Europe. Here the natural inclination of man toward disobedience (which can also entail exercising the right of resistance) may only be overcome if the political power guarantees men exceptional conditions of security and protection. In both cases, in Hobbes and in Locke, the political power of the European state necessitates and assumes that it be continuously reflected in the colonial world. Matteo Battistini’s essay (Insurrection, Bank and Contracts: how Society shaped the Principles of the Constitutional Order during the American Revolution) investigates the problem of rebellion during the American Revolution, not so much with reference to the protests that led to the Declaration of Independence, but rather with regard to the numerous cases of rebellion that took place during the 80s, as well as their impact on Congress, because of their relevance for the overall process of institutionalizing constitutional order during the revolution.Such a perspective reveals, for example, how the peasants of Massachusetts (1779) and Pennsylvania (1784) — the self-proclaimed true heirs of the Revolution — peacefully, and then violently, opposed the national elite; an elite that did not approve of any form of resistance to the type of representative government which the former English colonies had become. Two different concepts of popular sovereignty were at play in the opposition of the peasants' interests with those of the banks and merchants. One of the protagonists of the American revolution, Thomas Paine, responded to the requests of the peasants of Pennsylvania with his Dissertations on Government, the Affairs of the Bank and the Paper Money (1786), claiming that while rebellion against the English crown might be legitimate that against the republic was not. The republican representative system, in which changing social and economic practices are continuously institutionalized, did not leave any space for insurrection, because the system as such absorbed any of the revolutionary principles of popular sovereignty. Paola Rudan’s Bolívar’s Discurso de Angostura and the Constitution of the People, investigates the political experiences and speeches of Simon Bolívar in relation to the imperial European perspective which saw Venezuela as part of the West, placing the problem of the relationship between revolution and constitution in the specific political space of South America. Rudan does this through a close analysis of the Discurso de Angostura, presented at the opening of the General Congress of 1819, convened to outline and draft a new constitution for the Republic. Due to the eruption of civil war after the declaration of independence, the constitution promulgated in 1811 never entered into law. Rudan’s analysis demonstrates that, in this case, the relationship between revolution and constitution is, in a sense, flipped with respect to the experience of the American and French Revolutions. In Bolivar’s Venezuela the constitution could not be the product of the constituent will of the people, as the still needed to be formed by the constitution. Spanish absolutism had reduced the Americans to passive citizens; the Republic still needed to transform them into active citizens capable of offering their service and allegiance. Both the “people” thought to be the subject of the revolution, and the citizens, who were called upon to take the place of the subjects of the Spanish imperial order, had to be created through a process of institutionalization and constitutionalization. Bolívar’s understanding of the liberty necessary and indispensable for such a transformation (including the liberation of the slaves) brought together the concepts of Montesquieu and Rousseau in a dialectical relationship. The constitutional model that would serve to overcome the chaotic situation of internal conflict and civil war was however offered by Jeremy Bentham. In the presentations of Luca Cobbe (The Atlantic Refraction of David Hume's Political Thought) and Pierre Serna (Mandar ou comment penser la résistance sans violence durant l'été 1792?) obedience and rebellion, resistance and constitution — the themes central to the essays summarized above — were repeatedly referenced in their respective examinations of two political authors who were very different from one another, both with regard to their evaluation and judgment of the above mentioned questions as well as to the American Revolution and constitution. In order to properly summarize the set of arguments covered by the Bologna unit in its specific contribution to the PRIN 2009 — the title of my introduction to that workshop gives us an idea: Neither disobedient nor rebels: arguments from the laws between the Old and the New World — I will start with a text that was central to the presentation of Pierre Serna: Théophile Mandar’s Des insurrections. Ouvrage philosophique et politique, sur le rapport des insurrections avec la liberté et la prospérité des empires. Here I will only discuss the third, and by far longest, section of the work: 214 pages out of a total of 608. The section is subdivided in 34 chapters with the addition of one containing Mandar's observations on the six chapters immediately preceding it. In this third part, which confirms the book’s function as a of sort of Reader’s Digest of all previous scholarship on the theme, the first two chapters have the objective of defining insurrection. They do so through an examination of popular movements, understood more generally and in their three specific manifestations: insurrection, sedition (sédition), uprising (émeute) or revolt (révolte). It is worth noting here that for Mandar revolts do not occur in the context of a free people. The third chapter examines cases which necessitate insurrection and the motives for which it can be justified and legitimized. It is here, among other things, that Mandar defines the differences between insurrection («A fin de ne point dénaturer la grammaire de la raison, il faut donner le nom d’insurrection à toutes les conjurations qui tendent à ameliorer l’homme, la patrie et l’univers») and rebellion («Alors, le mot odieux de rebellion restera consacré à designer toutes les atteintes violentes portées aux loix d’un pays, par le factieux dont elles éclairent la perversité»), observing different manifestations of the two («L’insurrection ne se manifeste que dans l’absence des loix, ou du moins durant leur sommeil: la rebellion frappe tantôt la loi, tantôt le dépositarire de la loi ou le législateur. L’insurrection s’annonce avec l’esprit de paix, résiste au despotisme, parce qu’il anéantit la paix, et ne prend les armes que pour forcer ses ennemis à la paix»). When Mandar, after citing some examples from ancient history — Solon, Brutus, Lucretia, Virginia, examples commonly used for such a discussion — speaks of the most just forms of resistance, referencing also the revocation of the Edict of Nantes by Louis XIV («qui coûta a la France l’exil ou la mort de deux cents mille hommes»), he makes a particularly significant observation: «mais ce n’étoit pas du côté des protestants, c’étoit du côté des catholiques, que devoit éclore le germe généreux d’une insurrection; l’opprimé qui se défend dans une monarchie absolue, a trop l’aire d’un rebelle; il faut que ce soit le citoyen même qu’on arme pour être oppresseur, qui se justifie envers le ciel en frappant le pouvoir». For lack of space I will not discuss the passage's content with regard to the Catholic-Protestant relationship, even though it would certainly be merited. Instead, I will limit myself to underlining how the affirmation «l’opprimé qui se défend dans une monarchie absolue, a trop l’aire d’un rebelle» can be considered together with that of a few pages before «le mot odieux de rebellion restera consacré à designer toutes les atteintes violentes portées aux loix d’un pays, par le factieux dont elles éclairent la perversité». In an absolute monarchy, Mandar tells us, those who are oppressed and defend themselves appear too much as rebel. The hateful word “rebellion” must indicate only those violent attacks on the laws of a country by sectarians, the perversity of whom is manifested in those very acts. Why ‘rebellion’ is a hateful word is explained at much greater length several pages and 31 chapters later. 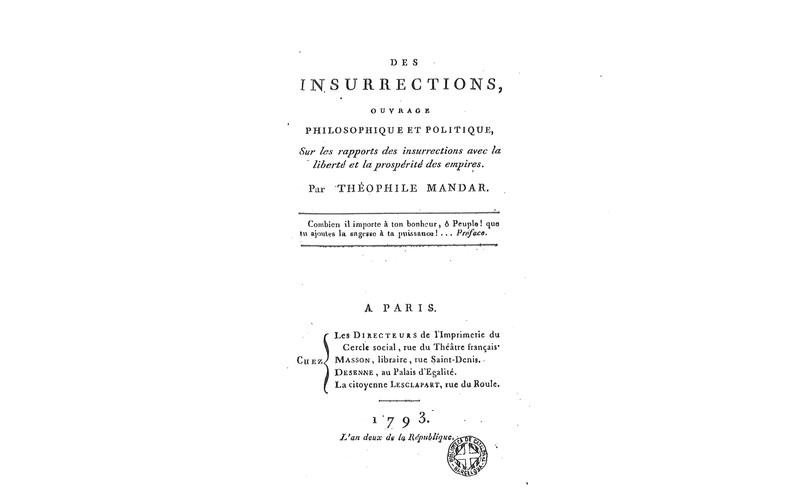 Returning to the French translation of Algernon Sidney’s Discourses concerning Government a little less than one hundred years after their first publication (1698), Mandar affirms that «Le soulevement de toute une nation ne mérite point le nom de rebellion». The importance for Mandar of the tradition of English revolutionary texts from the 17th century during the French Revolution, and in particular the relevance and the significance of the translation of Sidney’s Discourse were the subject of a very interesting, recently published essay, in which there is also brief mention of the problem addressed in Mandar's Chapter XXIX [Quastana 2014, 22]. Reading Mandar, who references Sidney, or better yet, reading Sidney directly («The General revolt of a Nation cannot be called a Rebellion» is section XXXVI of the third chapter of Discourses), after having read texts written long before Sidney that were the expression of events and problems long preceding the English Revolution, it is impossible not to recognize an age-old problem, despite it being expressed in Sidney's new language of the nation or the even newer significance given it (and which it had at the time) by Mandar. That which Sidney — and as a consequence also Mandar, around 100 years later — immediately underlines as the foundational problem at the beginning of the chapter is quite simply the question of legitimate self-defense in the face of oppression by an unjust and arbitrary government, as well as the criminalization of that legitimate self-defense by imposing false names on things: «As impostors seldom make lies to pass in the world, without putting false names upon things, such as our author [i.e. Robert Filmer, Patriarcha] endeavour to persuade the people they ought not to defend their liberties, by giving the name of rebellion to the most just and honourable actions that have been performed for the preservation of them; and to aggravate the matter, fear not to tell us that rebellion is like the sin of witchcraft». Defining just and honorable actions carried out in order to preserve a people's liberty as rebellion, and comparing it to the sin of witch-craft: i.e. the highest level of human lèse majesté (rebellion) is equal to the highest level of divine lèse majesté, witchcraft — as Sidney well knew — being equated with heresy. One can verify the prevalence of such a condemnation in a text that was contemporary although quite different from Sidney's: the anonymous penned History of Self Defence, in requittal to the history of passive obedience (1689) , in which the expression, phrased in a slightly different manner («REBELLION IS AS THE SIN OF WITCH-CRAFT») appears in capital letters and is connected with its original source, the Old Testament. In its discussion of numerous opinions in favor of passive obedience and against self-defense, the history noted: «I cannot here but take notice of a Passage of Scripture that has been egregiously wrested by our Non-resistance Men, that which was spoken by the Prophet Samuel to Saul upon his not obeying the Command of God when he was ordered to destroy the Amalekites, viz. REBELLION IS AS THE SIN OF WITCH-CRAFT, which has been used by them as an Argument for Non resistance till it’s become Thred-bare; and yet any ordinary capacity may see the weakness of it, since the Rebellion here immediately spoken of was not that of Subjects against a Prince (tho’ none will deny that, that which is really Rebellion is undoubtedly a great sin) but that of King Saul against God: So that is very far fetch when used for an Argument against whatever those Gentlemen are pleased to interpret Rebellion». Of the «great principle of Self-defence» the anonymous author had written, not too much earlier, «is the only Bulwark against Slavery and Tyranny», and that for this all those in favor of it were condemned by the Non-resistance Men «as Rebellious, Seditious, Enemies to Kings, &c.». The tone and arguments of the History are not so different, in my opinion, from those which characterize a text - although different for various aspects and written in a different period and context - like the pamphlet that John Donoghue uses as a central source for his essay. The text, Simplicity’s Defence Against Seven-Headed Policy, was written by Samuel Gorton. After fleeing from England across the Atlantic in 1636 in search of freedom of religious conscience, Gorton was condemned of sedition for having refused to conform to clerical Puritan orthodoxy and was exiled from Massachusetts two years later. Gorton provides a narrative of his trial in the form of a pamphlet containing the court records, publishing it in London in 1644 as a full account of his self-defense against the arbitrary action of the Massachusetts government. To locate traces of similar arguments in support of self-defense, which I tried to express with the title of my introduction to the Workshop of October 2013 Neither disobedient nor rebels: arguments from the laws between the Old and the New World, we must look back to the numerous revolts, rebellions, and tumults that preceded, were contemporary to or came after (one thinks here of Matteo Battistini’s paper) the great American and French Revolutions to find sources containing the “legalistic language” used in the different laws (human law, natural law, law of nations, divine law) on which it was possible to construct arguments on legitimate resistance. Here, I cannot go without mentioning an extraordinary source which I have analyzed elsewhere. Written in relation to the Catalan rebellion, the Noticia Universal de Cataluña is the jurist Martì Viladamor's condemnation of the university of tyrants led by Conte Duca Olivares who by changing the names of things defined the actions taken by the Catalans in order to defend themselves from their oppressive government as rebellion. Many other examples from the concreteness of history — the importance of which Locke was well aware (as Raffaele Laudani underlined in his essay in relation to the XVI Chapter of the Second Treatise) — could be used to show that within that concreteness, disobedience and resistance have consistently been conditions inherent to politics, even in the “Land” Europe. Demonstrating the importance and uninterrupted presence of those stories in history is not, however, a proposal or argument in favor of a “continuistic” vision of history — on the contrary. The task at hand — as recently underlined in an analysis of the justification of resistance in English Puritan thought between the end of the Elizabethan period and the beginning of the English Revolution — is to find and analyze «the re-emergence of resistance theory» [Burgess 2001, 185] in particular moments of history. It is an investigation which cannot be carried out primarily «in terms of influence … or in terms of continuity» . The task is rather «to understand the conditions that activate a dormant body of discourse or theory» . Legal language on rebellion has always contained, due to its casuistic nature, a «contentious discourse» , in which one debated whether or not the instance at hand involved legitimate or illegitimate resistance. In concluding, I’ll cite just one more example, in reference to the American Revolution, in this case judged positively by an English Dissenter. In one of his Fast Sermons, the minister James Murray claimed in 1781 that which in another context Algernon Sidney had already written almost a century before and which Théophile Mandar would write almost a decade later, citing Sidney: «Those who obey the fundamental laws of government cannot be rebels, though it is manifest that legislators that make laws contrary to natural justice and the law of God may be guilty of rebellion. … It is well known that there were no laws in existence that could make them [our brethern in America] rebels a few years ago; they were only created such, by the modern omnipotence of the parliament». The jurist Barolus of Sassoferrato had written something similar more than four centuries earlier (obviously without referring to the fundamental laws of government, nor to the modern omnipotence of the parliament) in his comment to the constitution issued by Henry VII to punish the Italian cities that opposed him, identifying every form of disobedience and resistance as rebellion and in doing so giving birth to the secular form of of the crime of lèse majesté. Murray J. 1781, Sermons for the General Fast Days, London: Printed for J. Adams, No. 10, Great Turnstile, Holborn; and sold by T. Axtell, at the Royal Exchange; and all other Booksellers in Town and Country. Seller A. 1680, The History of self-defence, in requital to the history of passive obedience, London: Printed for D. Newman at the Kings-Arms in the Poultrey (durable URL for the front page on EEBO). Sidney A. 1698, Discourses concerning government... published from an original manuscript of the author, London: Printed, and are to be sold by the booksellers of London and Westminster (read on EEBO). Bradley J. 1990, Religion, Revolution and English Radicalism. Nonconformity in Eighteenth-Century Politics and Society, Cambridge: Cambridge University Press. Burgess G. 2001, Religious War and Constitutional Defence: Justifications of Resistance in English Puritan Thought, 1560-1643, in von Friedeburg R. (ed. ), Widerstandsrecht in der frühen Neuzeit, Erträge und Perspektiven der Forschung im deutsch-britischen Vergleich, Berlin: Duncker & Humblot, 185-206. Cappuccilli E. 2013, Rebellion, Resistance and Revolution Between the Old and the New World: Discourses and Political Languages, Dipartimento di Storia Culture Civiltà Bologna, 2-3 ottobre 2013, «Scienza & Politica», XXV (49): 209-215, doi: 10.6092/issn.1825-9618/4243, http://scienzaepolitica.unibo.it/article/view/4243/3700. Cobbe L. 2014, Il governo dell’opinione. Politica e costituzione in David Hume, Macerata: Eum. De Benedictis A. 2007, Resisting Public Violence: Actions, Law, and Emotions, in Molho A., Ramada Curto D. (eds. ), Finding Europe. Discourses on Margins, Communities, Images ca. 13th - ca. 18th centuries, Oxford: Berghahn Books, 273-290. De Benedictis A. 2013a, Tumulti. Moltitudini ribelli in età moderna, Bologna: il Mulino. De Benedictis A. 2013b,“According to Bartolo”, “according to Baldo”. Archives of Knowledge for the Study of Revolt, in De Benedictis A., Härter K. (eds.) 2013, Revolten und politische Verbrechen, 17-40. De Benedictis A., Härter K. (eds.) 2013, Revolten und politische Verbrechen zwischen dem 12. und 19. Jahrhundert. Rechtliche Reaktionen und juristisch-politische Diskurse / Revolts and Political Crime from the 12th to the 19th Century. Legal Responses and Juridical-political Discourses, Frankfurt am Main: Klostermann. Donoghue J. 2013, Fire under the Ashes. An Atlantic History of the English Revolution, Chicago: The University of Chicago Press. von Friedeburg R. 2002, Self-Defence and Religious Strife in Early Modern Europe. England and Germany, 1530-1680, Aldershot: Ashgate. Quaglioni D. 1999, «Rebellare idem est quam resistere». Obéissance et résistance dans les glosses de Bartole à la constitution «Quoniam nuper» d’Henry VII (1355), in Zancarini J.-C. (ed), Le Droit de résistance XIIe-XXe siècle, Fontenay-St. Cloud: ENS, 35-46. Quastana F. 2013, La réception des Discours sur le Gouvernementd’Algernon Sidney au XVIIIe siècle français, «La Révolution française», (5), http://lrf.revues.org/1031. Sbriccoli M. 1974, Crimen laesae maiestatis. Il problema del reato politico alle soglie della scienza penalistica moderna, Milano: Giuffrè. Serna P. 2009, L’insurrection, l’abolition de l’esclavage et le pouvoir exécutif ou les trois fondements originaux de la République des droits naturels selon Théophile Mandar, in Belissa M. et alii (eds. ), La république des droits naturels, Paris: Editions Kimé. Serna P. 2013, La Repubblica dei diritti naturali di Théophile Mandar, in Serna P. 2013, Fratelli di Francia. Storia e storiografia di una rivoluzione diventata repubblicana 1792-1804, Milano: Guerini e Associati, 141-168. Serna P., De Francesco A., Miller J.A. (eds.) 2013, Republics at war, 1776-1840. Revolutions, conflicts, and geopolitics in Europe and the Atlantic world, Basingstoke: Palgrave MacMillan. 1. For a detailed account of the workshop: Cappuccilli 2013. 2. As a result of the work carried out by his research group, De Francesco, among other titles, has published Republics at war, 1776-1840. Revolutions, conflicts, and geopolitics in Europe and the Atlantic world, edited by Serna, De Francesco and Miller . 3. Since the workshop, Cobbe's research has been published as a monograph: Cobbe 2014. 4. Mandar 1793. For the historical contextualization and a thorough analysis of Mandar's text, see Serna 2009 (Italian trans. Serna 2013). 11. In the first part of the work, citing the French edition of Thomas Paine, Théorie et pratique des droits de l’homme, Mandar had written «liberté avoit été bannie de toute surface de la terre, la raison étoit considérée comme une rebellion»: Mandar 1793, 20, n. 1. 12. Ibid., Chapter XXIX, 354-372. 14. This is the type of research I have been conducting for years (see for example: De Benedictis 2007) and which I had the opportunity to further develop during the PRIN 2009 project: De Benedictis 2013a; De Benedictis, Härter 2013. 16. On the problem of lesé majesté from the medieval and the early modern periods, in the age of common law, Mario Sbriccoli's book Crimen laesae maiestatis. Il problema del reato politico alle soglie della scienza penalistica moderna, remains fundamental and indispensable: Sbriccoli 1974. 17. See von Friedeburg 2002, 10, whose brief mention of the text attracted my attention. 20. See Donoghue's essay in the present dossier (Transatlantic Discourses of Freedom and Slavery during the English Revolution), as well as in Donoghue 2013, 151-153. 21. Lately in De Benedictis 2013a, 171-185 and De Benedictis 2013, 17-18. 22. Reiterating here a concept used by Donoghue. 23. Murray 1781, 22 and 36-37. On Murray's text, I limit myself here to citing Bradley 1990, 155-157. 24. See Sbriccoli 1974; Quaglioni 1999; De Benedictis 2013a, and their respective bibliographies.